Current image from the product dB/dt forecast. the rate of change of the magnetic field. Geomagnetically induced currents (GIC) in technological systems are caused by rapid variations of the geomagnetic field (dB⁄dt) which are always associated with a geoelectric field driving currents in electric conductors. They can disturb the normal operation of pipelines by creating fluctuations in corrosion protection voltages and in the long term by possibly increasing the corrosion rate of the pipeline steel. Real-time monitoring of GIC can be based on ground magnetic field recordings from which GIC can be modelled. 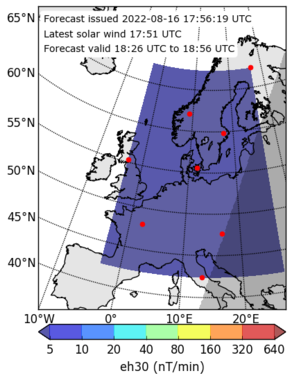 Short-term forecasts can be based on the estimated rate of change of the geomagnetic field (dB⁄dt), which provides a proxy for GIC. The purpose of this service is to give a general overview of GIC and pipe-to-soil voltage (PSV) activity. To assess in detail the magnitude of possible disturbances in pipelines, the products for Local Geoelectric Field include maps for power and pipeline operators. These can be found from the "Products" tab under the "Earth atmosphere and geomagnetic environment" tab. The products include also a table of modelled ground induced current (GIC) and the pipe-to-soil voltage (PSV). At the moment, the coverage of the PSV is limited to the Finnish natural gas pipeline, and the table of modelled GIC contains information only for Norwegian and Finnish power grids. The products under "Earth magnetosphere" include a collection of geomagnetic indices provided by Tromsø geophysical observatory (TGO), the German Research Centre for Geosciences (GFZ) and the Solar Influences Data Analysis Center (SIDC/ROB). These can be used to determine the current geomagnetic conditions. The products under "Interplanetary medium at L1" give forecasts and real-time data for solar wind properties. GIC are determined by using near real-time ground magnetic field recordings and models of specific conductor systems. As the regional measure, the sum of GIC at all substations of a power grid is used. This value is considered to be large when it exceeds a threshold corresponding to the top 0.1% of all values in long-term statistics. This is indicated in the plots by red colour. GIC in the natural gas pipeline are basically modelled in the same way as in power grids. Its measured value is also shown. The ground conductivity models for calculating the geoelectric field are approximate. However, the use of fixed models of the grids and of the ground conductivity ensures that GIC activity is characterised in a meaningful quantitative way. In other words, if this service indicates a high GIC level in the demo grids then large GIC occur in the true grids too. The service also includes regional products focussing on mid-latitudes. The Local Current index for Spain provides an indication of regional geoloeletric disturbances that can be used as proxy for GICs. This product is connected to a colour-coded scale that facilitates the communication of the results in terms of levels of disturbance. Users can also subscribe for geomagnetic disturbance alerts and regional reports via the UAH product link. Modelling of space weather effects on pipelines. Pulkkinen et al. (2001), J. Appl. Geophys., 48, 233-256. Recordings and occurrence of geomagnetically induced currents in the Finnish natural gas pipeline network. Pulkkinen et al. (2001), J. Appl. Geophys., 48, 219-231. Continental scale modelling of geomagnetically induced currents. Viljanen et al. (2012), J. Space Weather Space Clim., 2, A17.